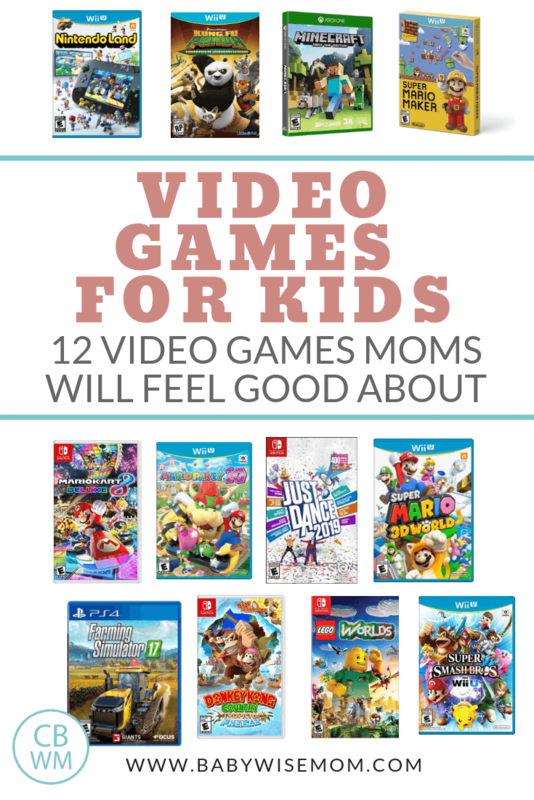 12 Best Video Games for Kids Moms Will Feel Good About. Clean video games that are safe for children to play. Video game list for children. Growing up, I loved video games. We didn’t own a gaming console until I was in fifth or sixth grade, but I have many cherished memories of playing at my grandparent’s house at Thanksgiving and Christmas from the time I was five all through my childhood. They didn’t have a lot of games, but I mastered and ruled those few. I could beat the first Super Mario game with one life playing upside down. To this day, I am unmatched in Tetris and Dr. Mario. Many have tried to usurp me. While I have a love for video games and many fond memories, I do not let my children have free reign with video games or technology in general. Our rules are they get 3 hours a week of video game time, and one week out of each month we do a full technology fast. When my children do play their video game time, I want them to play games I feel good about. I have found I generally prefer the games on the Nintendo consoles for younger players–up until actual teen years. Until recently, we have only owned Nintendo: the Nintendo 64, the Nintendo Wii, and the Nintendo Wii U. We have yet to get the Nintendo Switch; I am not sure if we will do that or ride out what we have and skip the Switch world. In the last couple of years, we got a PS4 (Playstation 4). This doubles as a Blu-Ray player for the family and a video game console for older games for Brayden. An Xbox can be used as a Blu-Ray also. The Xbox and PlayStation are similar systems. The games are similarly priced. There are games on the Xbox system that are not offered on the PlayStation system and vice-versa. When we were deciding what to get, we read a lot about both. People loved both. My parents have an Xbox, so getting a PlayStation made sense for adding variety and options. We also liked the PlayStation better overall when doing research. Brayden likes the PlayStation better than the xBox at this point. It is important to know that video games have a rating system. The most violet rating is “M” or Mature. We do not own any of those games and will never own them. I would consider them inappropriate for even adults to indulge in. The next level down is “T” or Teen. We have a couple of those for Brayden now. Only Brayden is allowed to play those, and his sisters are not allowed to view them. We heavily screen any T games that come into our home. One Brayden has is Star Was Battlefront. The next level is “E” for Everyone. This is what I allow my children to play who are younger than teenagers. Even with that rating, we research games before purchasing them. A fabulous website for all media for families is Common Sense Media. The following is a list of video games we have and like to play together as a family. The kids all like them and I feel good about them playing these games. Many of these can only be found on the Nintendo platforms. This has been a classic in Nintendo land since the Super Nintendo. This is a really fun game for families to play with each other. You can give some little ones a controller and let them think they are playing (not all will fall for it, but many will). Mario Kart is a game I will always love. This is kind of a Mario Minecraft-esq game. You can make your own levels and play them. It is creative. This is only one player at a time. Super Mario Maker is available on Wii U and on Nintendo 3DS. Mario Party games are very fun for families to play with each other. You play all sorts of challenges and it is just a good party game. You can get Mario Party 10 for the Wii U and a Mario Party for the Nintendo Switch. This is a family favorite. It is a super fun Mario game and we have not reached the end of the game yet. This is one of Kaitlyn’s absolute favorites. You can get this on the Wii U. We have always loved the Super Mario Brothers games, so whatever version of a Nintendo you get, a Super Mario game is a good way to go. This game always leaves my children in giggles. This is a game where characters fight each other, so it might be one you do not love. I haven’t seen negative effects in my children when they play it. Smash Bros can be purchased for the Nintendo Switch and for the Wii U. My girls and I all love to play Just Dance. It can be a great workout, so it is a fun way for me to get some cardio in during winter months when walking outside isn’t favorable. Brayden and Nate will join us in a game on occasion. When choosing a version, look at the song list on the game. They have Just Dance for Kids, also. Just Dance is available on the Switch, Wii U, PlayStation 4, Xbox One, Xbox 360, and the Nintendo Wii. LEGO games are really fun for kids. There are many different types of LEGO games for your child’s various interests. Some of our favorites are LEGO City Undercover, LEGO Movie Video Game, and LEGO Worlds (a favorite of Kaitlyn’s). LEGO Star Wars is also fun. 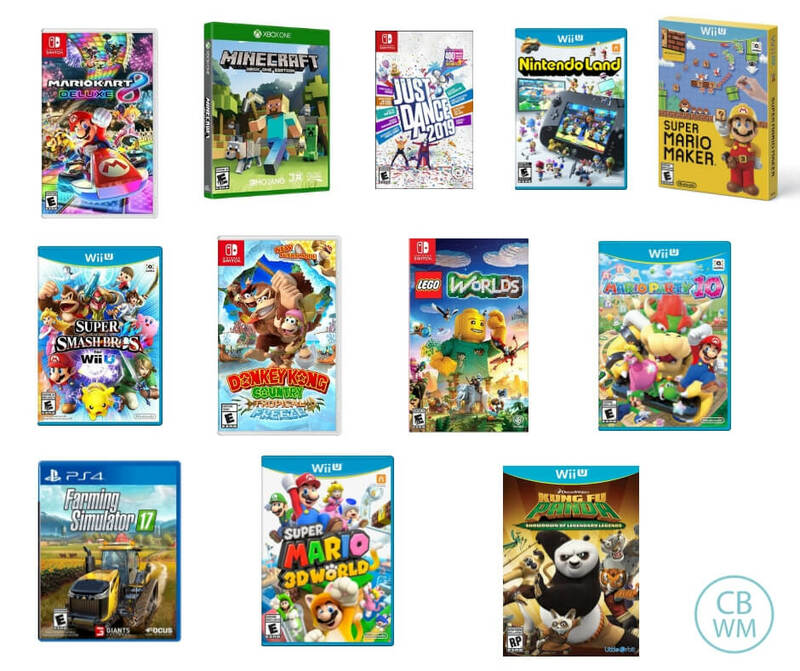 The different LEGO video games can be purchased on the Switch, Wii U, PlayStation 4, Xbox One, Xbox 360, and the Nintendo Wii, depending on the game. This is a very popular game. Something I don’t like about Minecraft is they can have zombies. You can play peaceful mode had no bad guys. I highly recommend that for young and sensitive children. Minecraft is available on most platforms, including PCs. Donkey Kong is a Nintendo only game. Our kids love it. It is different from a lot of the other games we have. It is two players and you can play at the same time. The game has multiple levels and they are kind of difficult, so it has some longevity. This game is available on Wii U and on the Switch. This is a fun game that can be played together, individually, or against each other. This is a Wii U game. This is a game where you just build a farm. Brayden really enjoys it. This is available for most platforms other than the Nintendo platforms. This is a fun game for the Kung Fu Panda fans. This is available on most of the platforms. If you are looking for some clean video games for your children to play, check this list out.